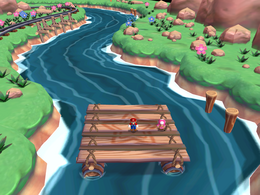 Wrasslin' Rapids is a Battle minigame in Mario Party 6. The only differences between day and night are aesthetic. Four cranes lower each of the four players onto the raft. The whole point of the game is for each player to knock the other one off the small, wooden, raft they are on. The players can press to punch the one of the other ones backwards; if the player does not fall off the edge, the player becomes impossible to hit for a small amount of time. However, if the punched player does fall off the edge, that player is eliminated the game. The players can also jump by pressing ; if one lands on another player, that player is squished, lightening the player's jumping ability. After the raft passes through a gate, obstacles begin to appear. 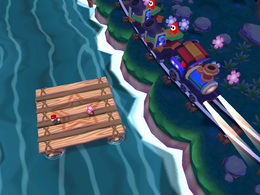 They include falling nuts and Shy Guys using cannons to shoot the raft while riding on a train as the raft floats down the river. The players have to watch out for other players and the obstacles, as they temporarily stun him or her. The last player standing, or the players that remain after the raft has come to a standstill win. The winners and losers perform their victory and loss animations at the beginning of the river. Rules – "Push your opponents off the raft as it floats down the river. The last player standing wins!" Advice – "Beware of falling nuts and incoming cannon fire!" This page was last edited on December 5, 2017, at 00:40.